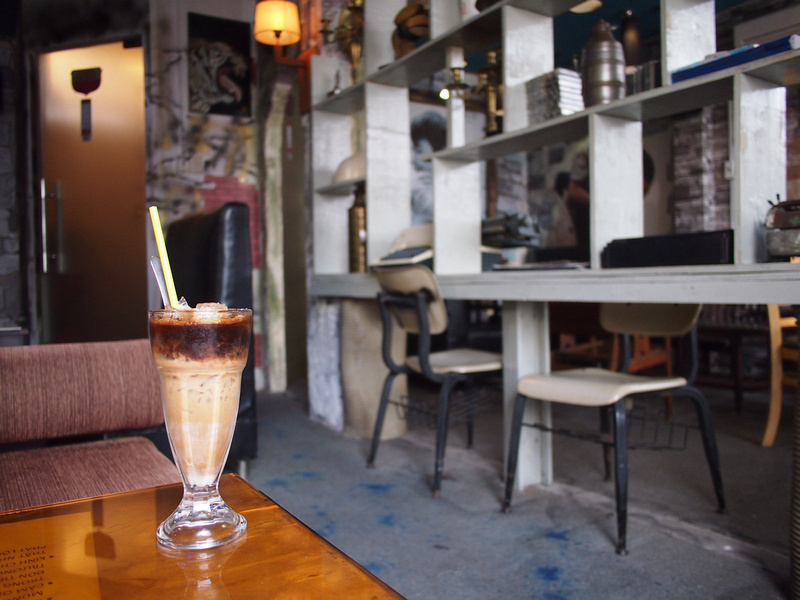 In my quest to visit different cafes in Saigon I’m always looking out for new places in my wanders. One day I found a sign pointing down an alley that stopped my in my tracks. It was for Cafe Saigon 1975. There are some years in history that are indelibly linked to a city; 1066 Hastings, 1453 Constantinople, and 1945, well take your pick between Berlin and Hiroshima/Nagasaki. 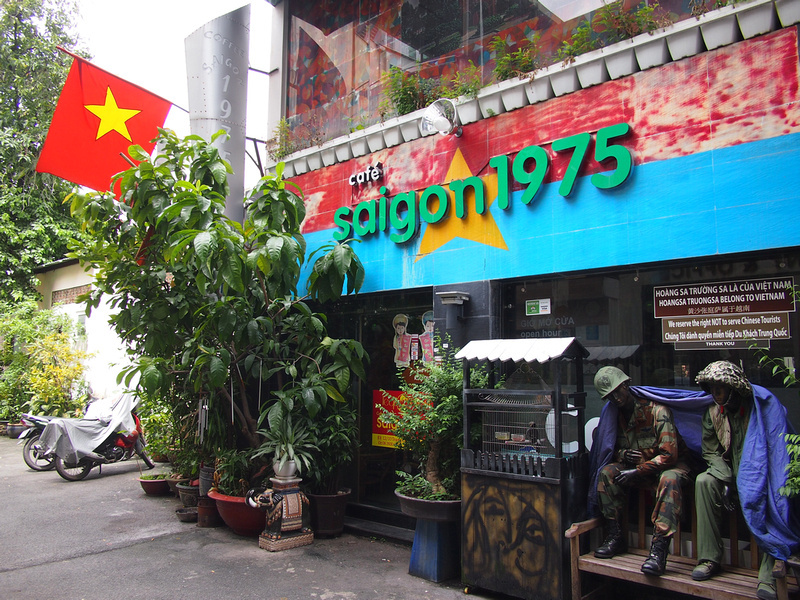 And 1975 is forever linked with Saigon. 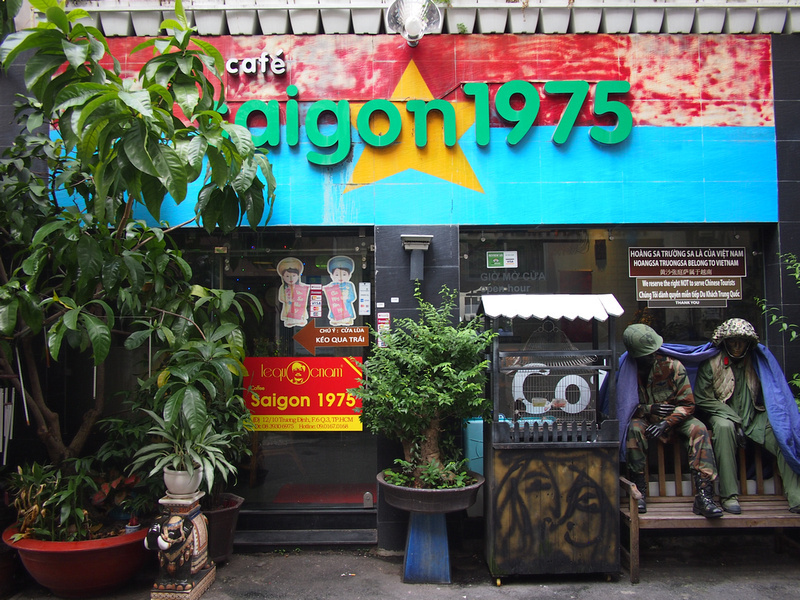 Modern-day Saigon is relatively light on war memorialisation (apart from the city being renamed after Ho Chi Minh), so seeing a cafe named after that time in history stood out as unusual. Upon arrival at the cafe you are left with no doubt that this is a liberation-themed cafe, with the flag of the National Liberation Front (NLF) used by the Viet Cong, emblazoned across the front entrance. 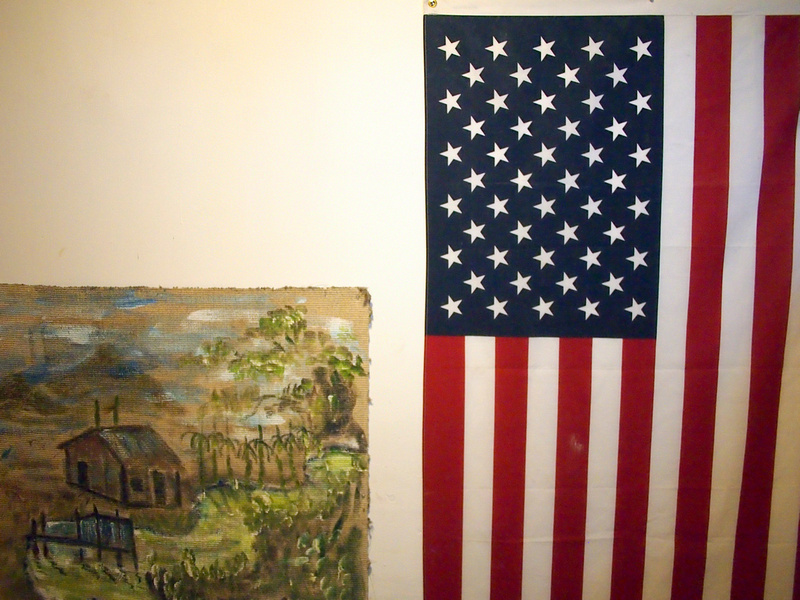 You never see this flag anywhere, except for war commemoration events. Another sign of the nationalistic agenda is this notice on the front window for Chinese tourists. The sign is regarding the disputed Paracel and Spratly Islands in the South China Sea. 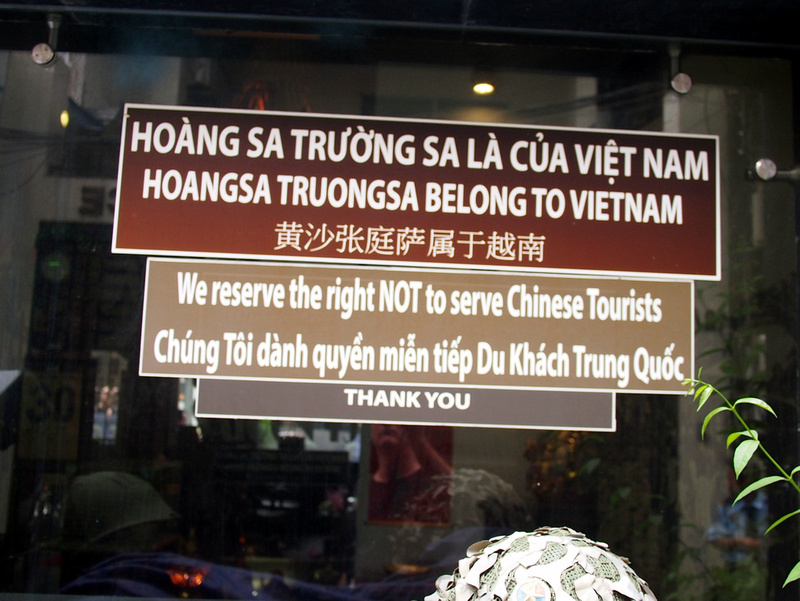 I have seen similar anti-Japanese signs in China, and anti-Israeli signs in Thailand, but this is the first time I’ve seen such a sign in Vietnam. I guess Americans, Australians, and other war-time belligerents are welcome. 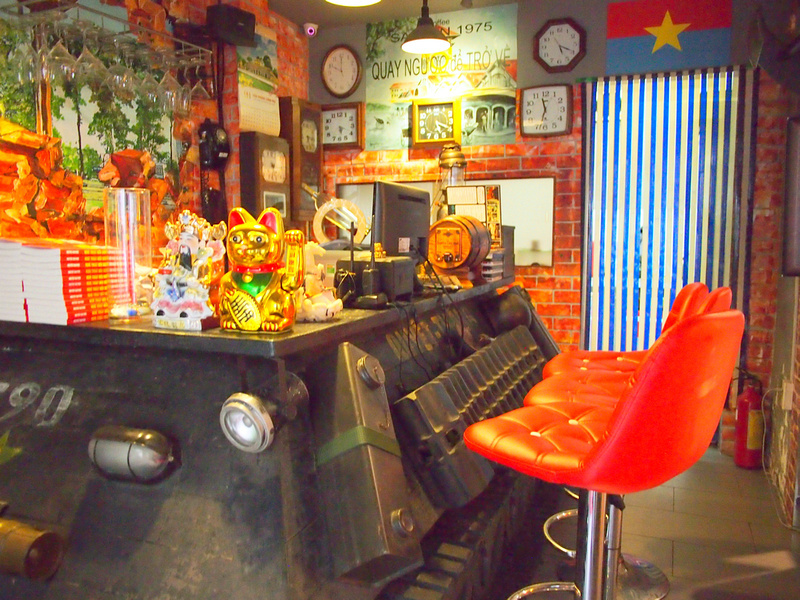 There is a bar in the entrance which is decorated as a tank. I was beginning to worry I had stumbled into a secret commie den and I wouldn’t be welcome. I was then greeted by two friendly waiters who suggested I go upstairs to the lounge. On the first floor there is a karaoke and live music space which has some old photos on the walls. The action is on the second floor, which is a lounge area with all sorts of trinkets and memorabilia. 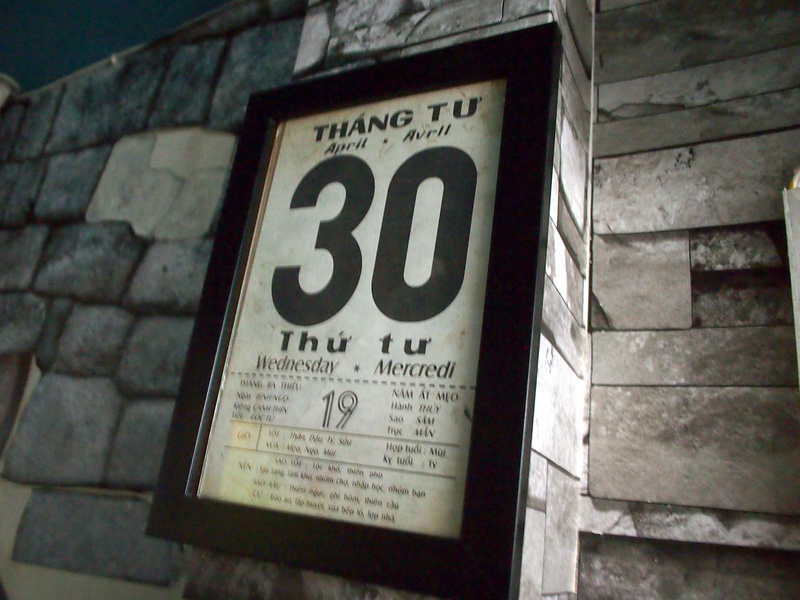 There is a calendar that is frozen in time on 30 April, 1975 – Liberation Day, or Black April, depending on your side. (For more photos of this day check out the Fall of Saigon gallery). This photo of a mother and son was featured on propaganda posters around the city during the 40th anniversary celebrations. This is one of the most moving photos of the war. I don’t know the background of it, but to me it represents peace, with the exhausted mother having lived every moment of a ten thousand day war. 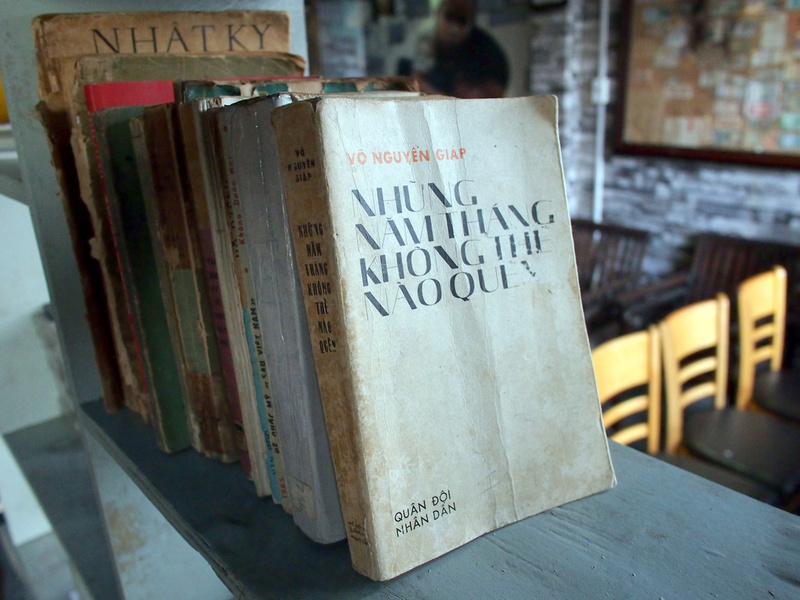 Some old books on the shelf include works by Vo Nguyen Giap, and a book on the famous victory in Dien Bien Phu. On the wall there is a fascinating collection of old bank notes. 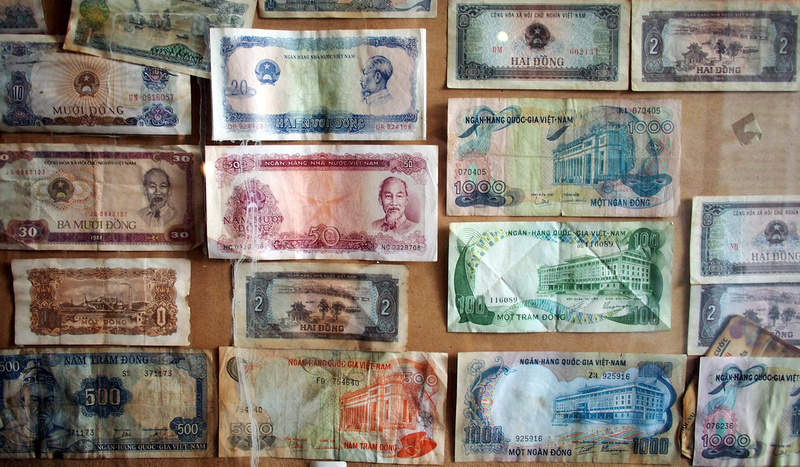 The Dong is the world’s highest denominated currency, and here you can see the progression of inflation with older notes being lowly denominated one dong notes. And I found my weakness – old maps! 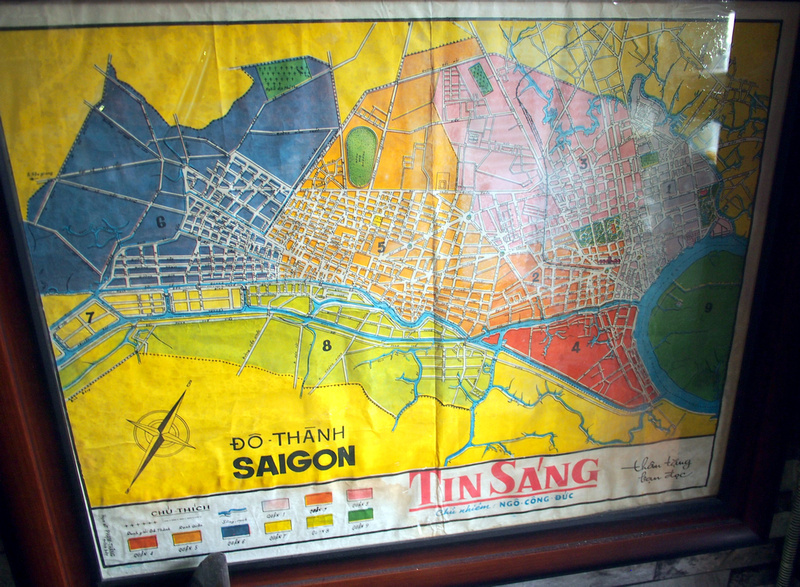 There are some great maps of old Saigon here (behind glass so it was hard to get a picture). There are currently 24 districts in Saigon and I’ve always wondered about the naming system. For example the arrondissements of Paris form a clockwise spiral, yet the numbers here are all over the shop. It turns out that the first 12 districts that are numbered did follow some order. As the city grew, the districts were amalgamated and new areas were assigned low numbers. So district 2, which is now a new area on the other side of the river, was once next to district 1 on the main side of the river. When the city expanded beyond the 12 districts, the new districts use names. On the map these districts are farm and swampland. Interesting to note that the airport was in open space, and now it’s surrounded by the city. When I first came to Saigon in 2005 I was kind of expecting more war paraphernalia on sale. I recall a friend asking me to get an American Zippo lighter for him, as if they just lying around as debris on the street. 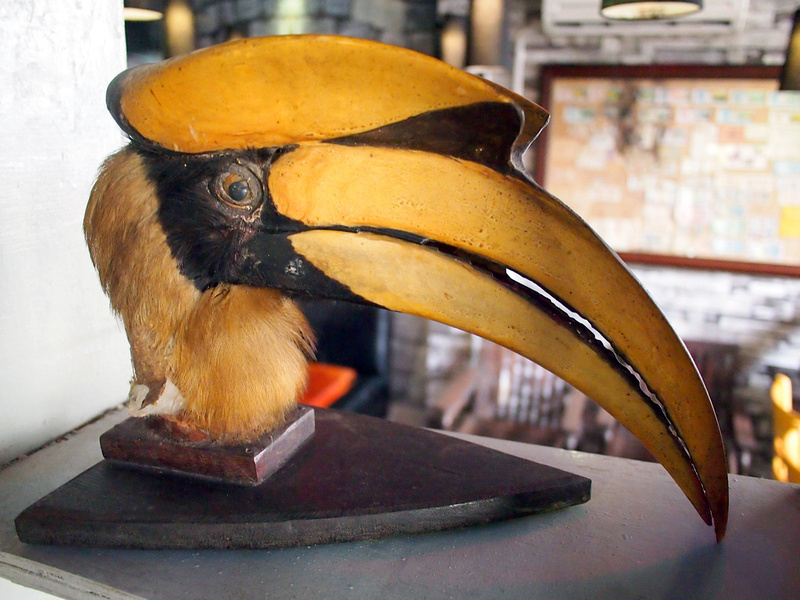 I have heard if you were a traveller in Vietnam in the 1990’s that you could buy such things. As you would expect, those days are long gone. Most of the trinkets you see now in shops is knockoff stuff. 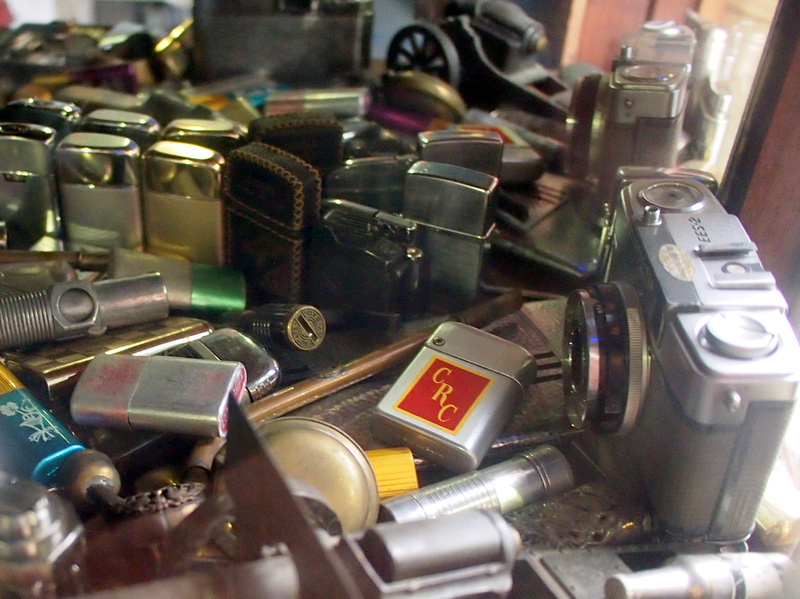 I was thinking of this as I looked into this cabinet of old lighters, wondering if any of them are war-era. 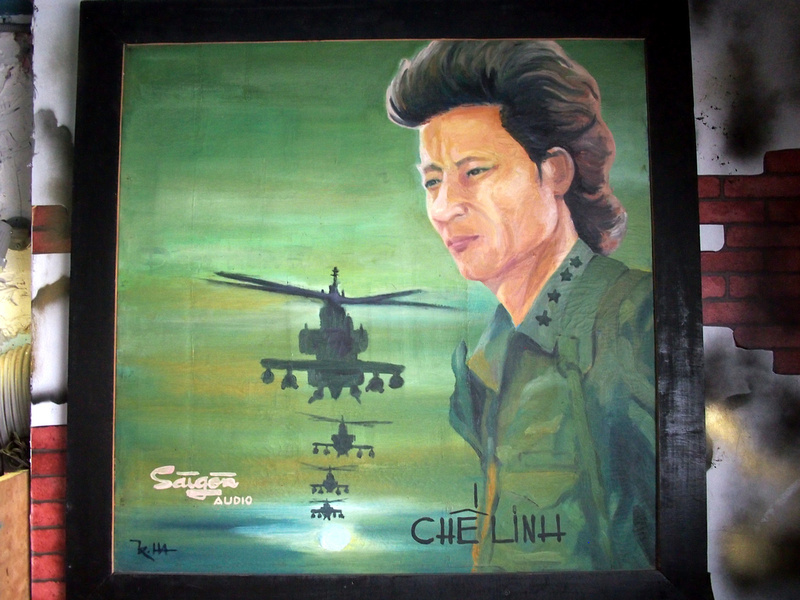 A portrait of an album by Che Linh. 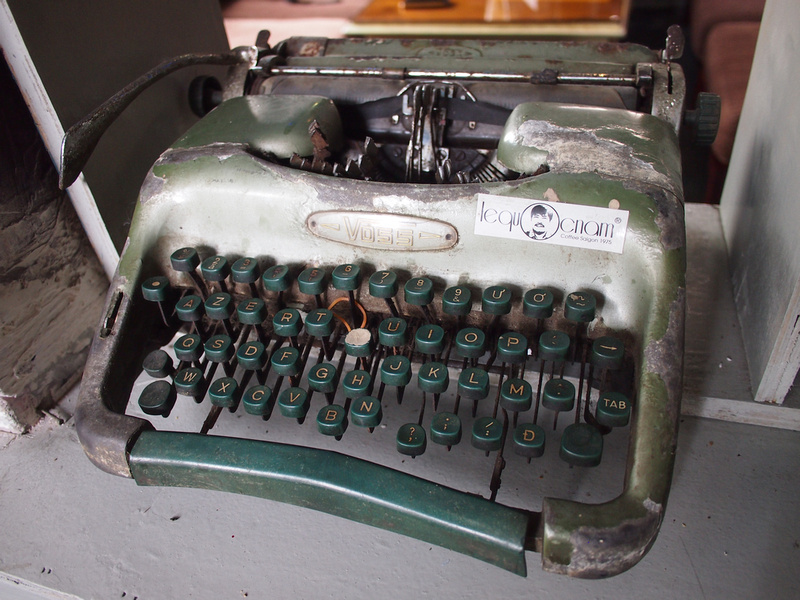 I’m old enough to remember typewriters as a writing instrument. My 5-finger pecking-style typing is derived from the early use of typewriters. And these, kiddies, are rotary dial telephones. When I was a boy we had to put our fingers in the corresponding numbered holes and dial each number. After all that was done you were not guaranteed that the person on the other end was near their phone. 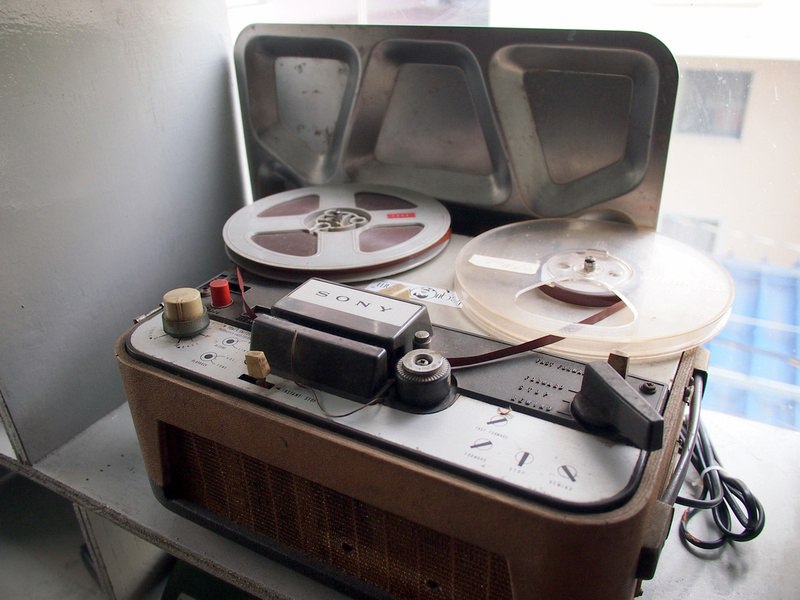 Now this one is before my time (I was a cassette tape kid), though apparently hipsters are making reel-to-reel tape cool again. 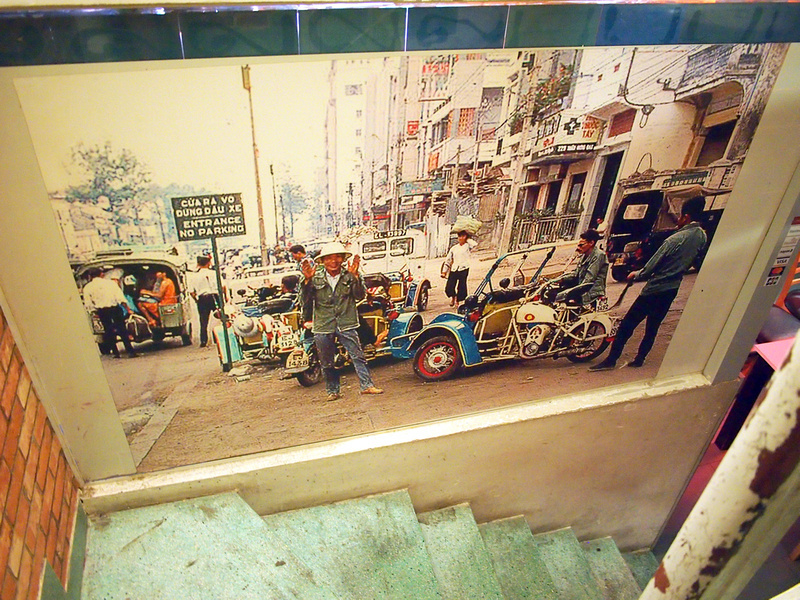 There are some old photos on the wall of everyday Saigon in the 60’s and 70s. 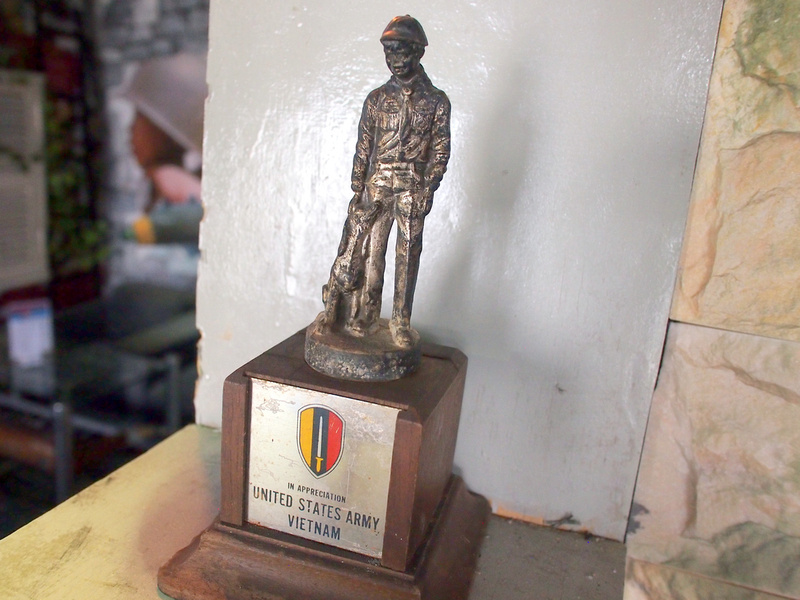 There is not much in the way of American war trophies here, though I did find this actual trophy. And there is an American flag hanging on the wall. It is the American War after all. And lets not forget that it’s a cafe, so here is my generously-sized ca phe sua da. 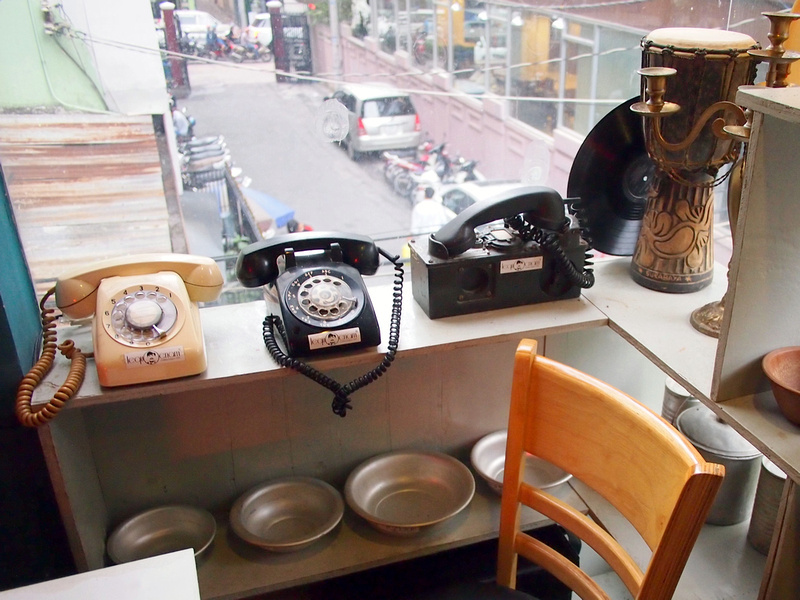 As with every other cafe in Vietnam, it comes with free wifi and free iced tea on the side. 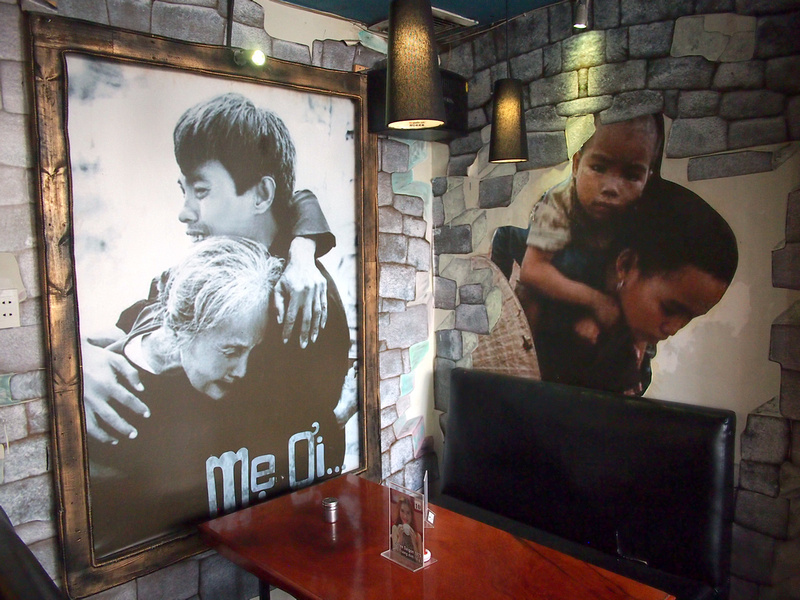 The cafe was opened by Le Quoc Nam, who is a veteran of the war with Cambodia in 1979. Read an interview about the cafe here. It’s an interesting place and worth going to see the memorabilia alone. I’m not sure I would make a regular place though, as I prefer to have my coffee while not thinking about the sorrow of war. In the interview he said he wants to open more branches. I think it would good to just keep finding more historical items and adding them to the one place. If you are looking for more war-era sites in Saigon, check out my guide on visiting war photo locations. Hi Sam, good to know – thanks!